In celebration of Rolfe Judd’s fiftieth year, 5×10 brings together five commissioned artists and ten creative collaborators for a very special event. Creativity has always sparked inspiration at Rolfe Judd. it was an easy decision to mark this occasion with an exhibition of art in recognition of the people we’ve worked with, the work we’ve done – and the projects that still lie ahead of us. Creativity has played a vital part in establishing Rolfe Judd as it is today.It’s important to emphasise that 5X10 is primarily a celebration of creative influence and excellence. 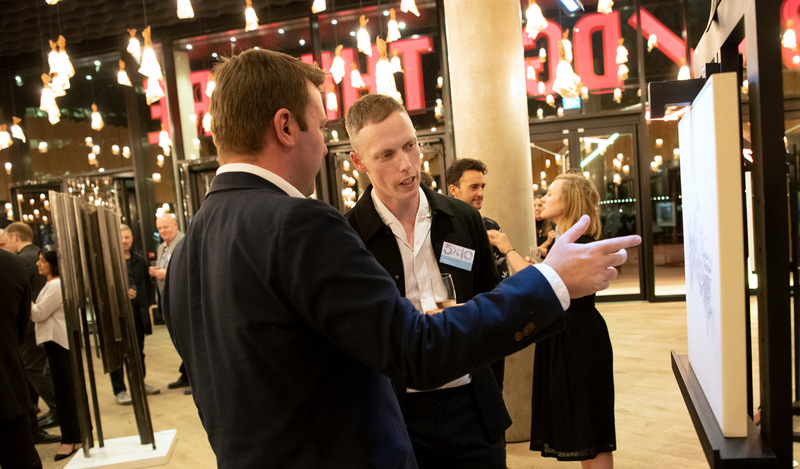 We selected our venue, the Bridge Theatre, in recognition of the powerful creative energies that the arts are capable of introducing into our lives. 5X10 allows us to celebrate a landmark occasion for Rolfe Judd. With this in mind, and also being aware that so many aspects of our work are inextricably linked with urban development, renewal and regeneration, it feels appropriate that for 2018 we have partnered with Centrepoint. The five commissioned artists exhibiting at 5X10 have been selected to create their own unique interpretation of a specific aspect of our work, from the broader impact of a largescale project to a crucial detail. Our ten creative collaborators add breadth, variety and perspective to 5X10. At Rolfe Judd we frequently invite artists to contribute to our schemes – for example developing art for public spaces. Each has been invited to submit an example of current work. Rolfe Judd in partnership with Centrepoint; the UK’s leading charity for homeless young people. Centrepoint is a registered charity in England & Wales. Registered Charity No.292411.